1. To cook the ribs, pre-heat an oven to 150 degrees c, then cook the ribs for 40 minutes, covered with greasepreoof paper and tin foil. Uncover the ribs an cook for a further 20 minutes until falling from the bone. 2. Meanwhile, to make the salsa, finely dice the shallot and pineapple and crush the garlic. 3. Whisk the oil, sugar and vinegar thoroughly, then add the shallot and pineapple and garlic. 4. Leave the mix to rest for 1 hour before serving. 5. To make the slaw, whisk the sesame oil, oyster sauce, soy sauce and siracha thoroughly. Add the zest and juice of the lemons and limes. 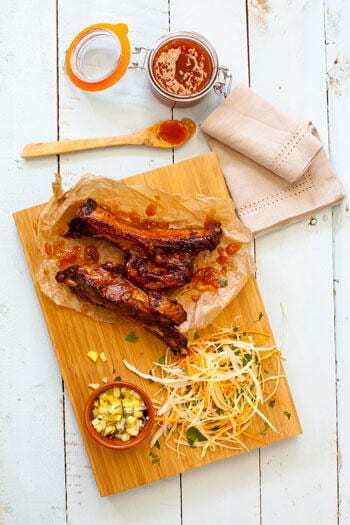 7.Serve the ribs with a little of the slaw and some salsa on the side.